Promote your success in your space and against your biggest competitors based on unbiased, third-party reviews. 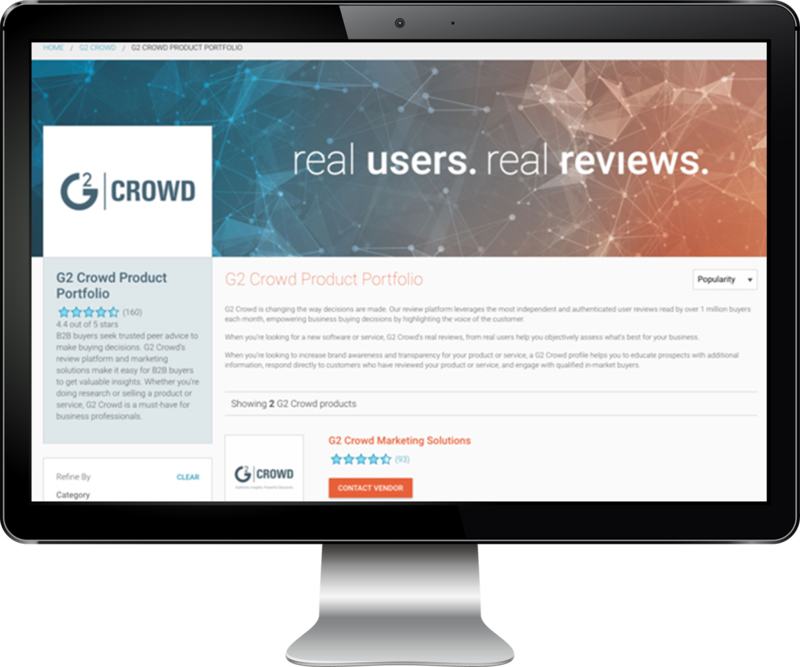 G2 Crowd category Grid® Reports compare products in a given category based on satisfaction and market presence scores. 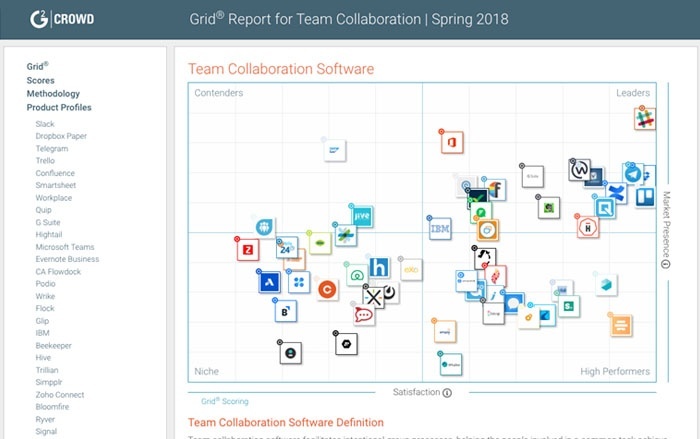 Grid® Reports can be overall grids, or segmented grids; segmented grids are segmented by company size (small-business: companies with 50 or fewer employees; mid-market: companies with 51-1,000 employees; and enterprise companies: more than 1,000 employees). Provide education and background information for prospects to do their due diligence. 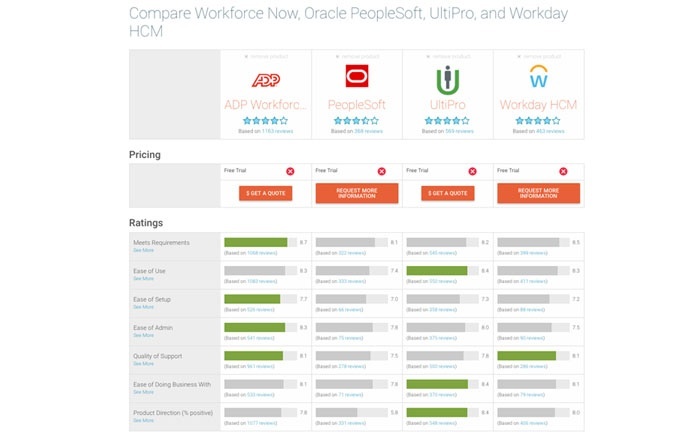 Show potential customers how you compare against all products in your space head to head based on: satisfaction, market presence, and feature ratings. 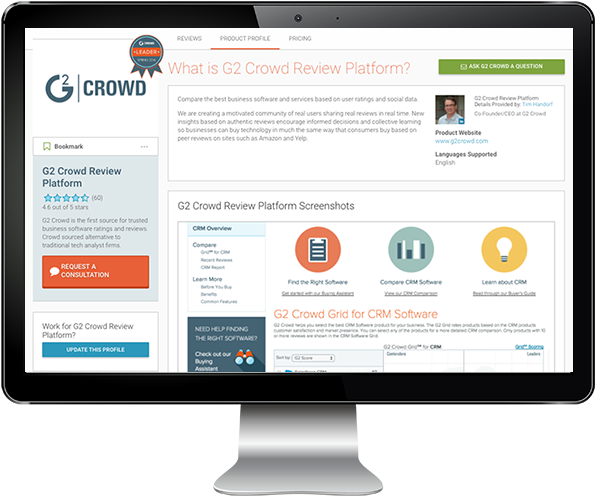 G2 Crowd category Index Reports aggregate several data points collected from verified user reviews to provide a unique and focused score for evaluating a single factor in the software purchase process. Index reports highlight product success in usability, implementation, relationship, or results. Index Reports are segmented by company size (small-business: companies with 50 or fewer employees; mid-market: companies with 51-1,000 employees; and enterprise companies: more than 1,000 employees). This index presents users responses to implementation-related questions such as ease of implementation and time to go live. This index presents user responses to questions regarding their relationship with a software vendor overall, such as quality of support and ease of doing business with a vendor. 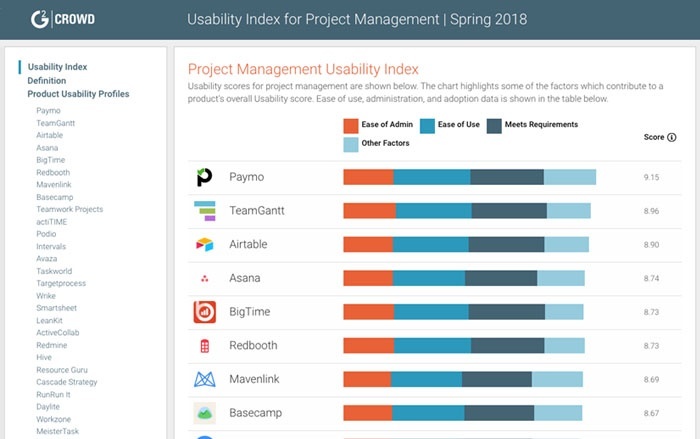 This index presents user review data related to the results associated with software products such as user adoption and return on investment. This index presents users responses to questions pertaining how easy a product is to use overall and whether products meet their requirements. 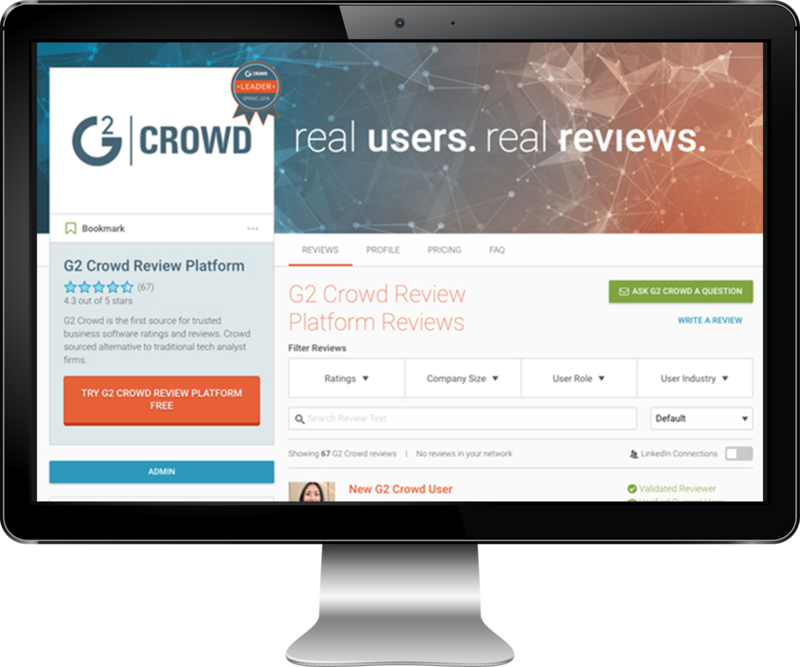 G2 Crowd Compare Reports feature a side-by-side comparison of up to four competing products based on satisfaction ratings, and highlight the leading product for each metric. Compare Reports are great for your team to use as ‘kill sheets’ to close deals against your biggest competitors. Show potential customers how you compare against your main competitors head to head based on a multitude of factors. Allow your customer data to speak for itself with an easy to digest piece of competitive content. Momentum Grids show the growth trajectory that products have had in their respective spaces over the last year. 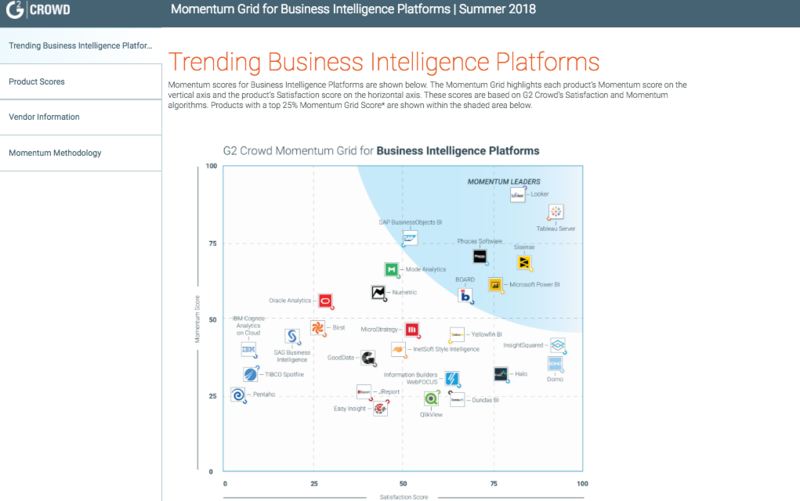 The Momentum Grid identifies products that are on a high-growth trajectory based on user satisfaction scores, employee growth, and digital presence. This is one more way G2 Crowd helps keep our community apprised of the products that are pushing the boundaries of their category, which helps buyers looking for new technologies make more informed purchasing decisions. Help prospects understand the future of the space and what you’re doing to make sure you don’t fall behind. Present third-party proof to investors that you are growing rapidly and are poised to become an industry leader. G2 Crowd is free for vendors and buyers. With a free profile you can: get reviews, respond to reviews, and be included in reports. Increase brand awareness by continuously getting new reviews of your product and add basic product info to your profile to help prospects get a better understanding of how your product works. Use reviews on your profile to close deals already in the pipeline and follow up on leads as soon as you get them. Find brand advocates that love your product who could potentially turn into case studies and reach out to users who are having issues to help get the relationship back on track. Educate prospects with additional information, respond directly to customers who have reviewed your product or service, and engage with qualified in-market buyers. Increase brand awareness by continuously getting new reviews of your product with the help of your Customer Success Manager and add branded content to your profile to help educate prospects. Enable Track Your Prospects to learn what information your prospects are looking for and use reviews on your profile to close deals already in the pipeline. Find brand advocates who love your product and could potentially turn into case studies and reach out to users who are having issues to help get the relationship back on track. 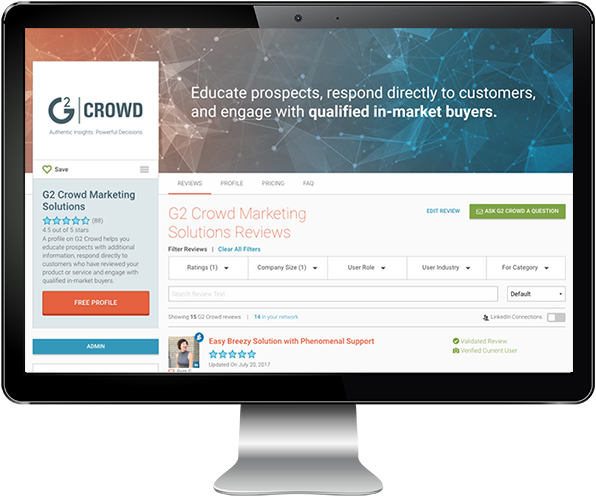 Identify in-market buyers, respond directly to customers who have reviewed your product or service, and show off your success on G2 Crowd. Know what organizations are looking at your profile by checking Buyer Intent data and enable Track Your Prospects to learn what information your prospects are looking for. Increase brand awareness by continuously getting new reviews of your product with the help of your Customer Success Manager and get Marketing Qualified Leads (MQLs) by adding branded content to your page to live behind lead walls. Find brand advocates who love your product and could potentially turn into case studies and understand when current customers are about to churn with Buyer Intent data. Expands your presence and make sure that every buyer is aware of the full suite of offerings you provide. You’ll also have access to our Sponsored Content across individual product pages. Master Profiles are available for companies with suites of three or more products. List all of the products in your product suites on one page to help your prospects understand how the suite can solve all of their current pain points. Highlight your mission and values while promoting your growing product lines. Cross promote products within a suite via Sponsored Content. Guide customers to best fit products. Implementing an effective review strategy can help your business sell more, improve your product, and turn unhappy customers into advocates. Already have a profile? Upgrade now!